As a child I spent most of my time drawing. At first I liked to make up my own cartoon characters, then in my early teens I discovered superheroes and learned how to draw the human figure. 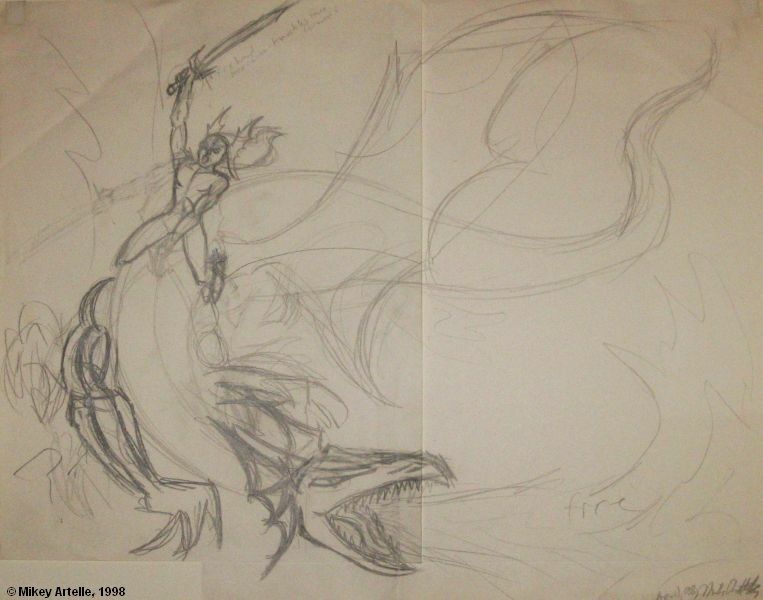 A decade later in my early 20's I discovered the amazing and breathtaking world of fantasy art. While I certainly don't claim to be a master of this genre by any means, I do find it quite inspiring. This blog page presents a selection of the fantasy sketches and characters that I've created over the years. In 2014 I began working toward publishing my own comic books and in 2015 launched my new comic book brand Pythor Comics. 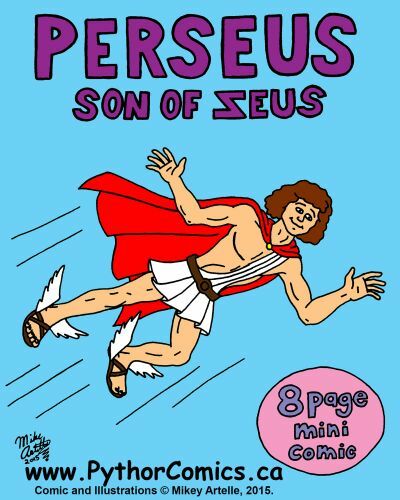 To date I've created six mini comics, three of which are based on my puppet show "Heroes Past and Present". The mini comics can all be read for free on this blog as well as on the Pythor Comics website. Here is a sample page from the "Pythor the Barbarian" mini comic! 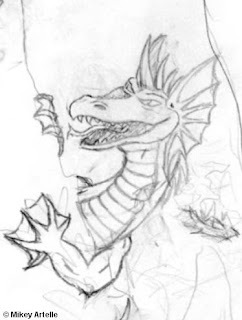 This is one of the first sketches that I did of Pythor's nemesis Doomstrike the Wizard. I've created several stories for Pythor that I'd like to do as comic books or storybooks, for which I have a whole cast of new characters. 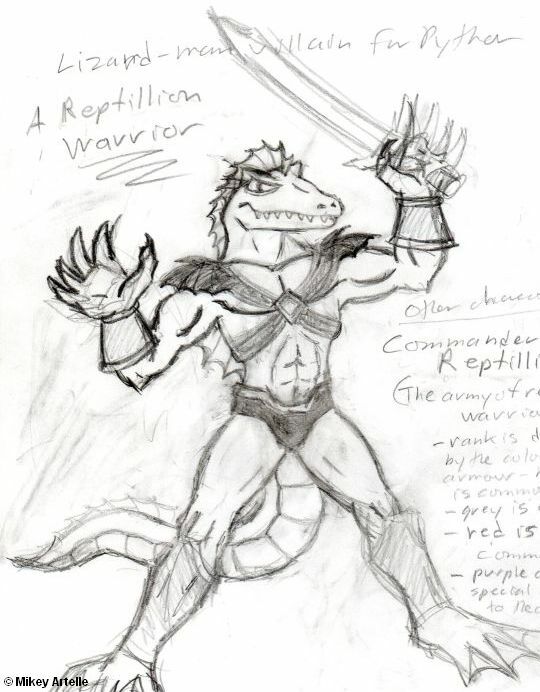 Among them is a species of villainous, green lizard dudes that I call Reptillion Warriors! They're after Pythor's mystical Dragon Amulet which gives him the Power to summons his mighty Dragon Axe. 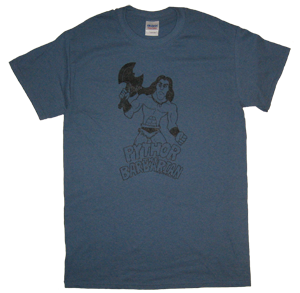 I also made a Pythor the Barbarian T-Shirt which is available on this blog! 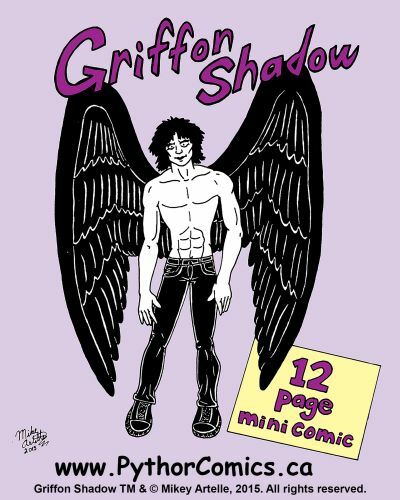 Griffon Shadow is my Gothic Fantasy hero and one of my gay "superhero" characters. I don't know of too many gay heroes, so I made up my own! 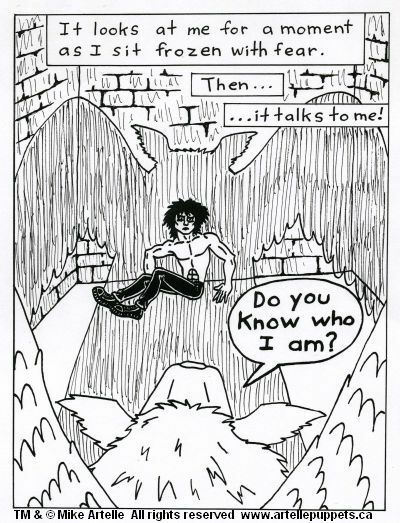 The first Griffon Shadow mini comic was created and posted online in 2015. 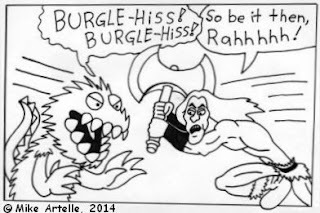 It's free to read online along with my other mini comics, here on this blog or on the Pythor Comics website. 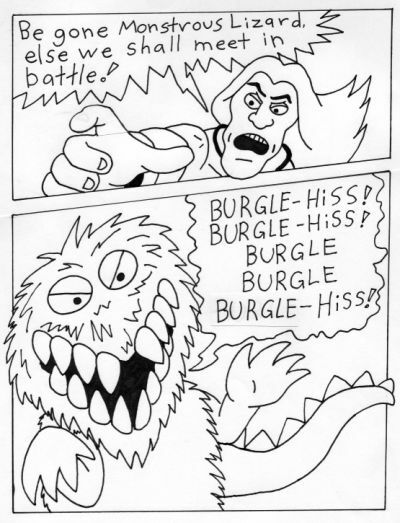 Above is a sample page from the "Griffon Shadow" mini comic book! 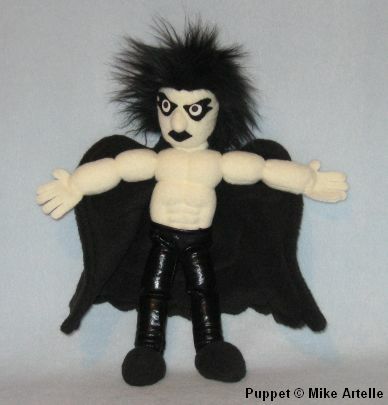 This is the prototype toy puppet of Griffon Shadow which I hand-made. 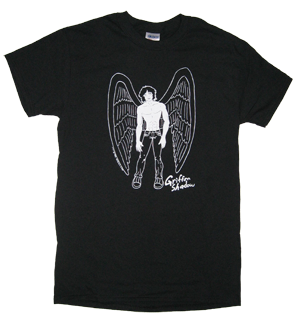 I also made a Griffon Shadow T-Shirt based on the comic book cover! Above is the original sketch I did for the Griffon Shadow comic book cover, created June 2013. 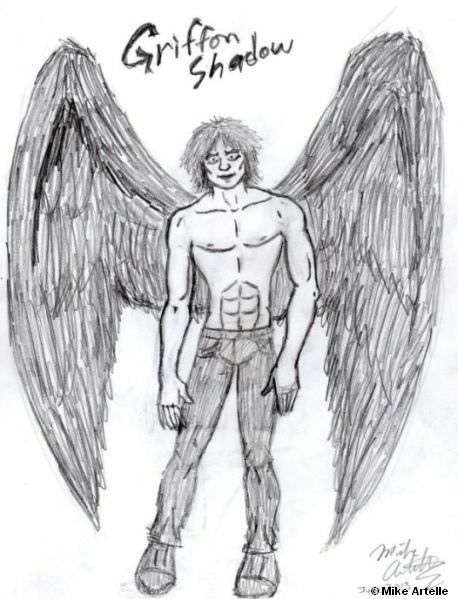 Griffon Shadow Story Synopsis: Kevin Conrad, an average college football player, wakes up in a strange and evil land to discover that he has inexplicably become Griffon Shadow, a zombie with supernatural powers tasked with being the Guardian of the Underworld! While carrying out his duties in purgatory he must also rescue his boyfriend Michael, who has been pulled into the underworld as well. Then they must find a way to escape from Hades to return back to their natural human life on earth. 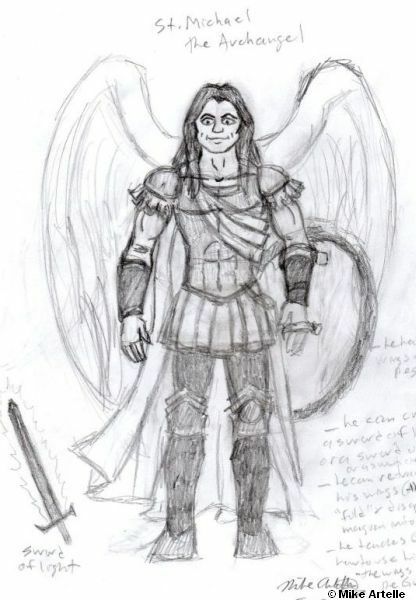 Here is Griffon Shadow's boyfriend Michael McNichol reincarnated in the form of St. Michael the Archangel, messenger of souls from the underworld. I really admire statues of St. Michael that depict him as a warrior battling Satan, so I used them as the source for this drawing. 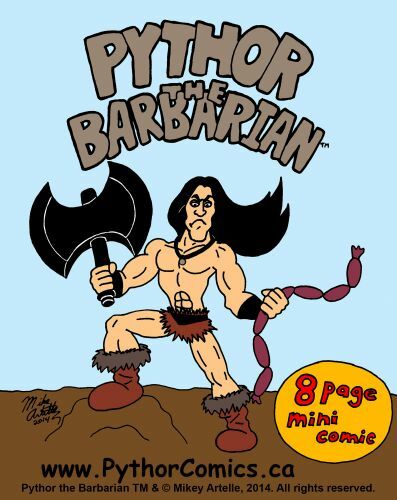 This is a more recent addition to the selection of mini comics on the Pythor Comics website. It presents some scenes from the Perseus puppet show. The comic can also be read online for free on this blog. 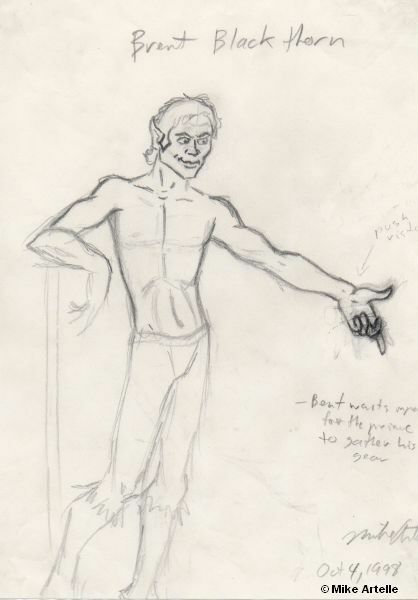 Above is a rough sketch of Perseus, made in the late 1990's or early 2000's. 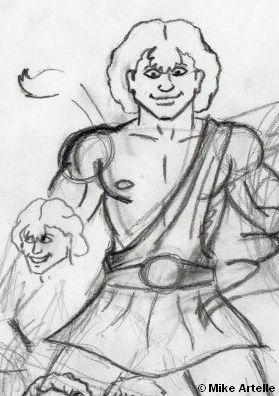 This drawing was later used as a reference for the Perseus puppet that I made for a touring puppet show "Heroes Past and Present". Here are some prototype toy puppets for the Perseus story that I hand-made: Roman Guard, Perseus, Hermes and Medusa! 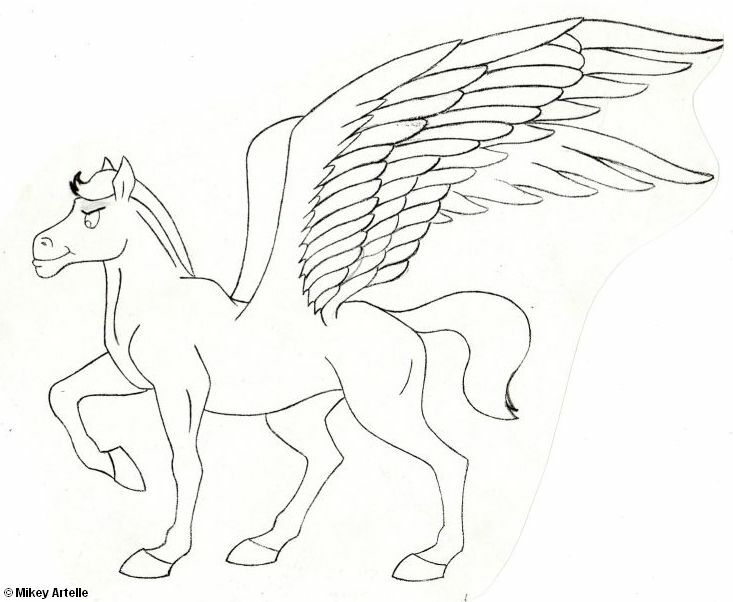 Here is a drawing of Pegasus that I made while studying animation in college during the mid 1990's. At the time I had plans to do a short animation based on Perseus and Pegasus in which they confront the Minotaur. I still have all of the rough sketches and layouts. Hopefully someday I'll get around to finishing it! That would be awesome! I made this drawing of a handsome prince around 1990 during my High School years. I drew this fantasy character when preparing to play my first game of D&D. A friend was going to show me how to play but we never finished setting up the characters. To this day I have never played D&D! 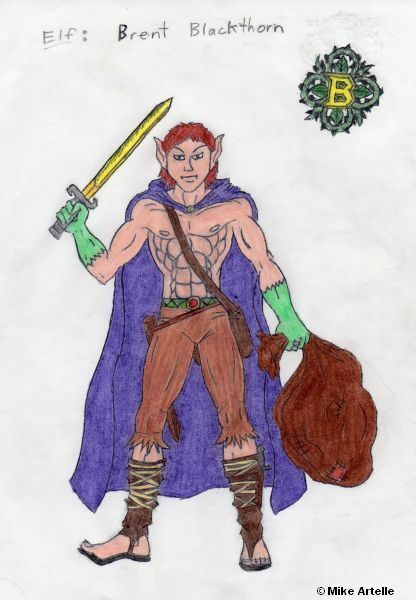 None the less, I'm happy to have created Brent Blackthorn the Elf! He turns up again later on. This photo was taken between 1996 to 1998 when I was in my mid 20's. It shows my drawing desk in the background, where some of the fantasy drawings that are shown here were created (see more below). 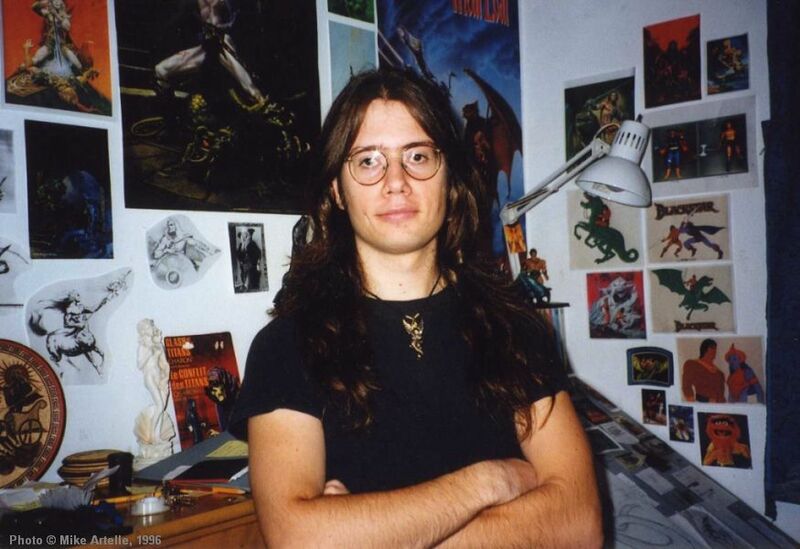 I was and still am a fan of fantasy artist Michael Whelan, as is evident by the posters on the wall behind me. In my 20's, I had a hard time accepting that I was gay and figuring out my place in a heterosexual world. Whenever I needed to stop worrying about being gay I used my art to "escape" from the real world. 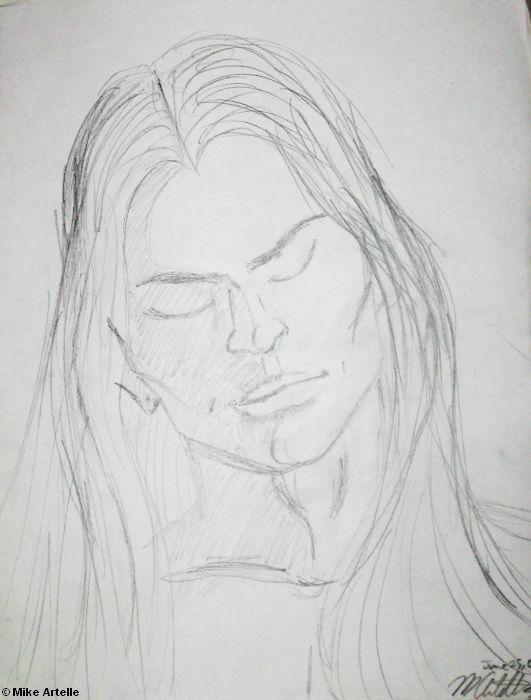 As I've always admired guys with long hair, they were often the topic of my drawings where they became brave warriors, powerful barbarians, fearless knights, and handsome princes! 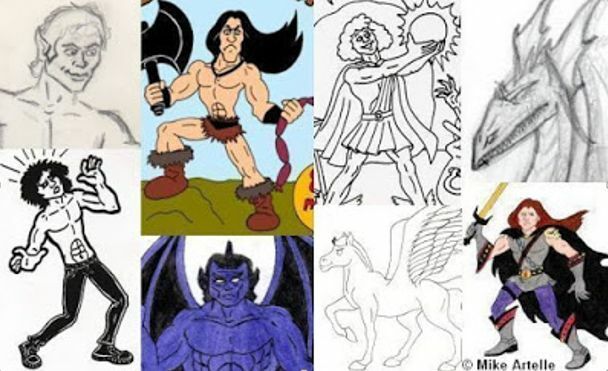 Below are a few of those drawings. 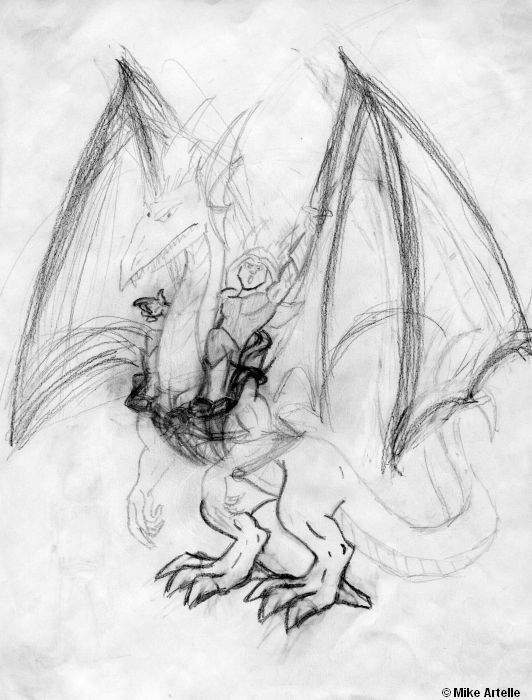 Here's a very rough concept sketch for a picture of Psycho Warrior riding his dragon as it shoots fire! To bad I didn't finish this in more detail, I really like this one. 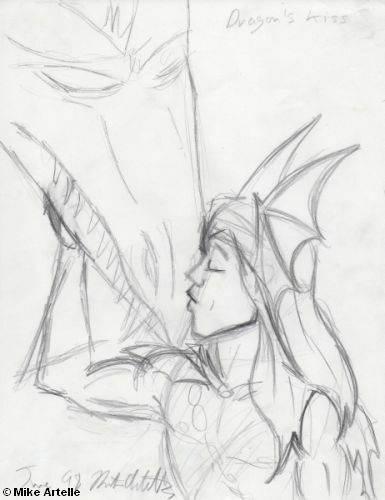 This sketch from June 1998 shows how much Psycho Warrior cares for his dragon. Instead of just showing Psycho Warrior's aggressive side in battle, I thought it would be interesting to show the nurturing side of the character. It also makes the dragon seem more tame as well, like the classic "boy and his dog" type of story. Psycho Warrior's pet dragon is his only family and his closest friend. They form a bond of eternal companionship and at some point each risks their life to save the other. Here is one of the few drawings from that time period that I actually finished and coloured. 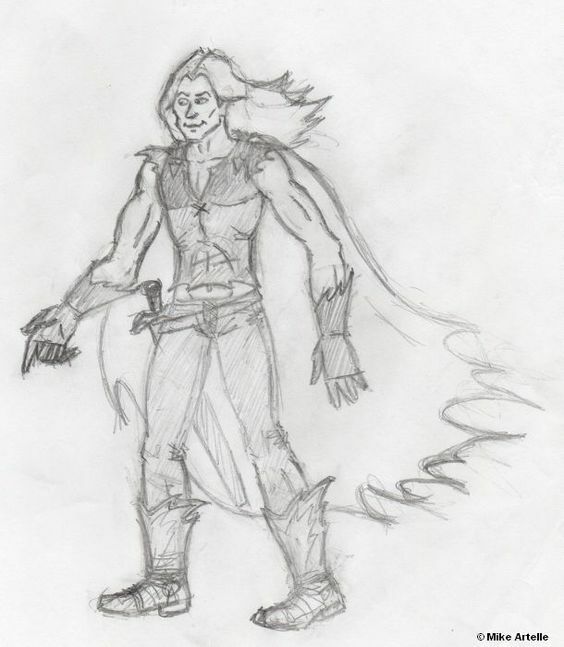 Originally this was going to be Psycho Warrior, but I think that character's costume needs to be darker, so this picture became another character, Prince Jonathan Boldheart. Later on, I made a puppet of Prince Boldheart for my live show Heroes Past and Present. 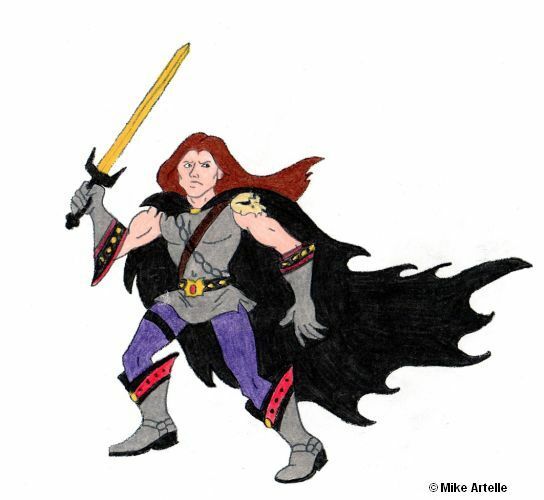 For a while in my 20s the Prince Boldheart/Psycho Warrior character was somewhat of an alter ego for me. I had grown my hair long, so in a way this is an artist's self portrait...without the glasses! 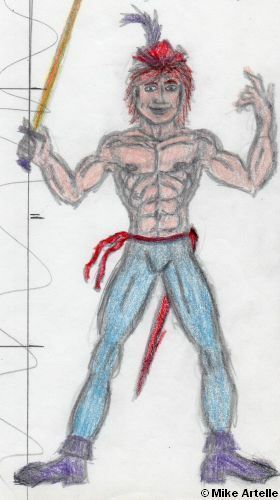 This is another drawing of Psycho Warrior that I did at some point after the coloured one shown above. It's not dated but it would have been from the late 1990's to mid 2000's. It's an updated, more complete version of the character with more detail than the previous sketches. When I drew this picture, I imagined that the sleeping prince was being lifted up into the air by some kind of wizard's magic. Here's Psycho Warrior in a different pose. I like the expression on his face. 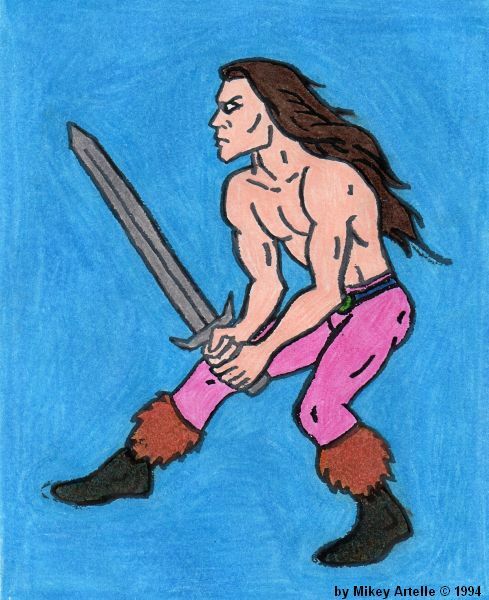 ...another Warrior Dude drawing that I think is really cool! 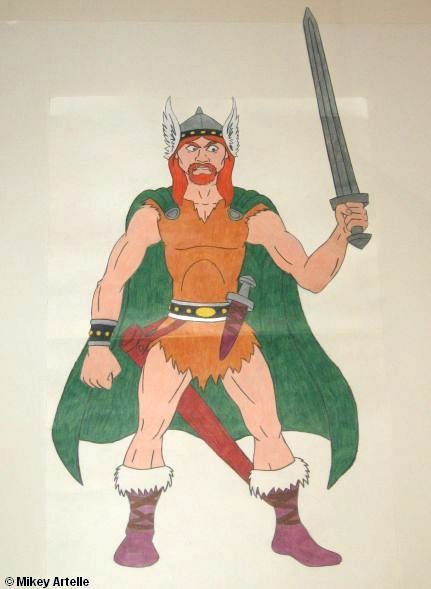 Here is a large Viking Warrior puppet figure that is about 20 inches tall. The head and arms are separate, movable pieces inserted into slits in the cardboard. I made the mouth move (using popsicle sticks) in the same style as a ventriloquists' puppet. 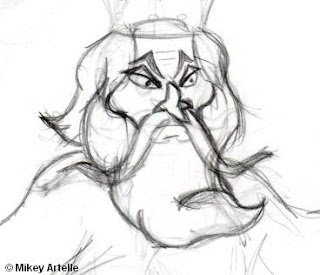 At first I just wanted to make an illustrated puppet head with a moving mouth and thought a Viking would be an interesting head to draw. Then drawing for the head turned out really nice, so I wanted to draw a body for it, and then thought about making the arms move just to add another moving element. There's no practical use for this guy, just a fun art project for sake of doing something creative. However, I find this would be an interesting way to do a stop-motion animation! 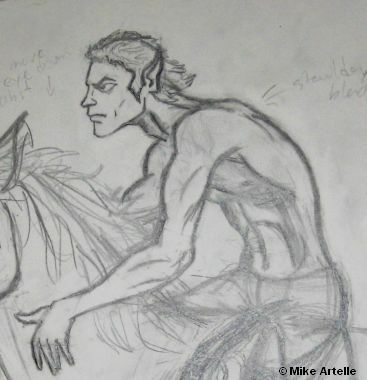 A sketch of Brent Blackthorn the Elf from Oct 4, 1998. By this point I had written most of the story about this character and wanted to publish it as a storybook. I haven't given up that this may yet happen. Below is another sketch of Brent Blackthorn. He's riding a unicorn but I drew it too big so I cropped the image. 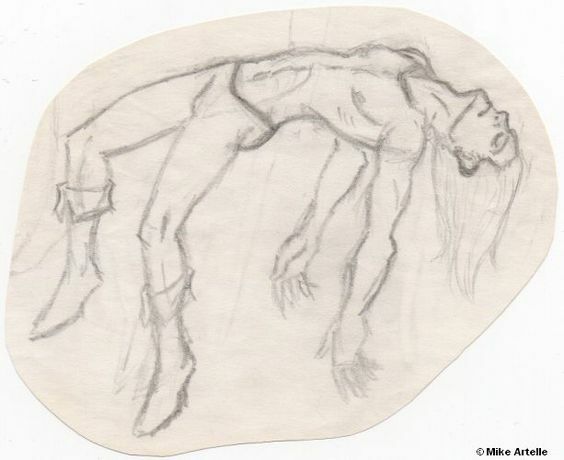 This sketch is from August 8, 1999. A beautiful guy with long hair. 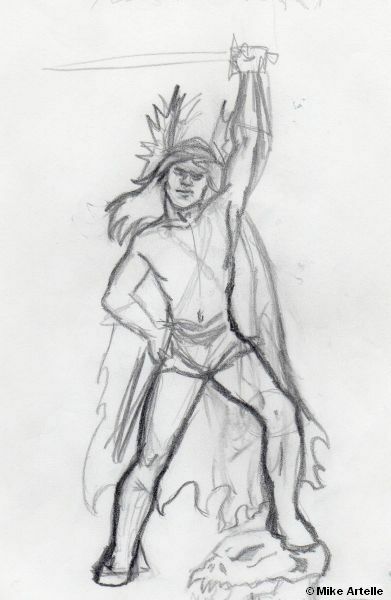 Like my warrior characters and superheroes shown above, this sketch was made completely out of my head. It's not meant to be any character though. This is an expression of how I feel about guys with long hair. I really like how it turned out. It was drawn on June 25, 2001 when I was 27. I've always hidden this sketch away because I was worried about being gay, and feared what people might think when they see it and learn my true feelings. In fact, I had even forgotten about this drawing until it was found while looking for material for this online exhibit! So I'm especially happy to have this one online where it can be enjoyed by others. I completely adore him! In my late teens I started drawing a lot of fantasy characters and dragons. 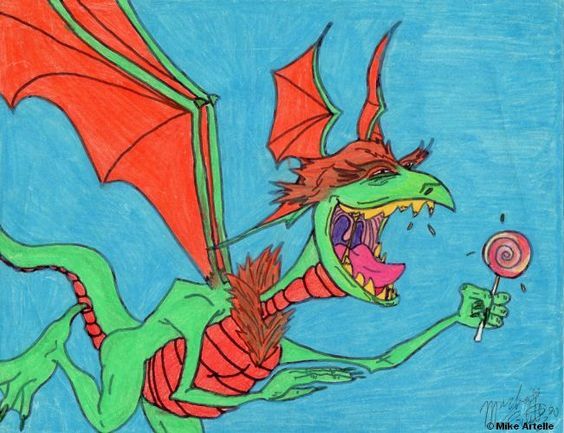 This is a funny dragon that I made up, the Sucker Dragon, which has a sweet tooth for candy. I drew this picture in 1990. Here is another dragon illustration that I made around the same time. Unfortunately it got folded at some point. 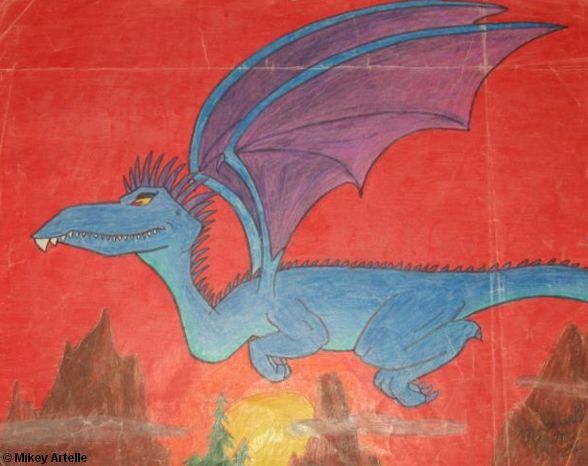 I later wrote a story featuring this dragon which, once again, I had wanted to publish as a storybook. Someday I'll get my act together and finish it! These next two drawings, above and below, were done in the sketch book that I used to carry around with me between classes at college. I don't know why most of my fantasy drawings are unfinished sketches. It does bother me to see them all incomplete. When I look at these sketches I see the completed version, and forget that that's not what others are seeing too. Finishing all of these fantasy drawings so that I can use them in a storybook is at the top of my to-do list! 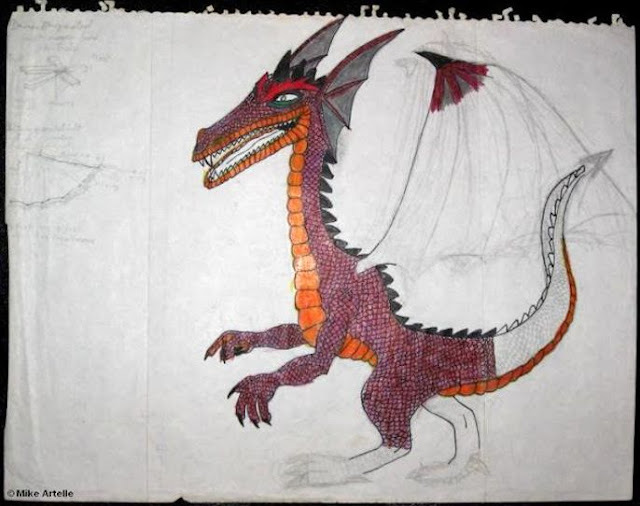 I drew this character when I was in my mid teens during the late 1980s. He's a demon that I call "The Puppet Master". 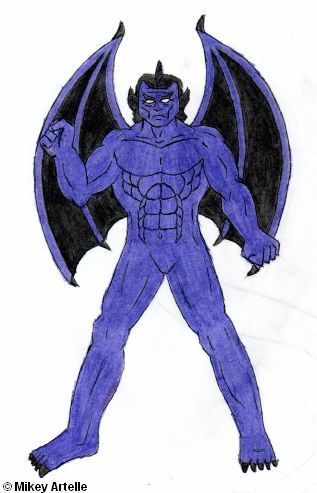 I had created my own cast of superhero characters and this guy was the first villain that I made for them to confront. However, since he's a demon he seems to belong here with the other fantasy characters rather than on my superhero artwork page. 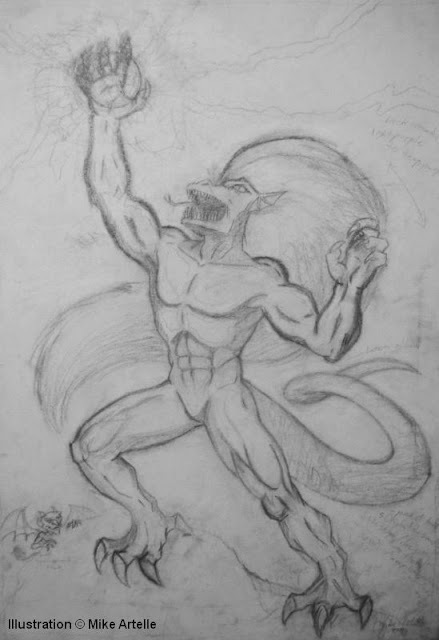 This is a sketch of The Demon of Chaos that was done on canvas in the late 1990s during my mid 20's. I was really into fantasy art paintings at the time and had wanted to try doing some of my own. It was my intention to paint it with acrylics. Finishing this painting is still on my "to do" list, so hopefully someday soon I can add the completed coloured version here. 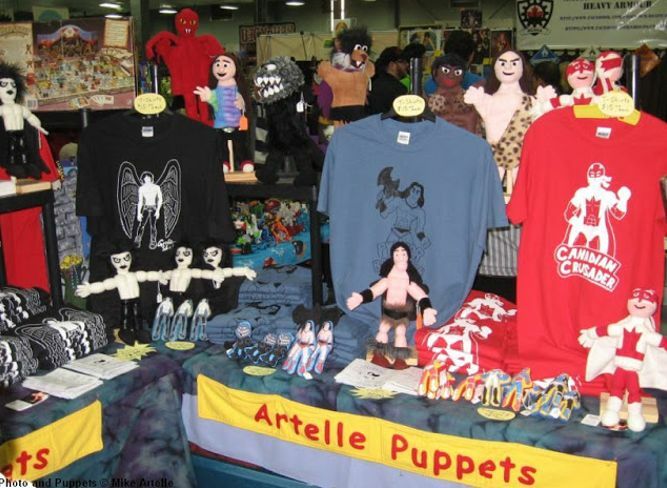 In September 2014 my company Artelle Puppets had a booth at Ottawa Geek Market. Shown above is the display of superhero items including hand-made puppets, hand-made and illustrated stuffed superhero figures, mini comic books, and three different T-shirts for Griffon Shadow, Pythor the Barbarian and Canadian Crusader. These are currently available on the Pythor Comics website as well as on this blog.